Christian Urban waves his hands to make a point, then looks at his nails and cracks wise about needing a manicure. He regularly touches his chin and his knees as he talks. 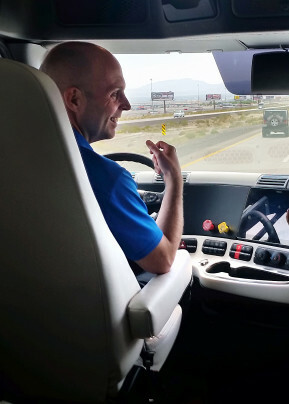 There’s nothing terribly unusual about this, but for the fact Urban is at the wheel of a 40-ton semi rolling down the I-15 highway outside Las Vegasat 60 mph, and he’s not steering. Or even paying much attention. The truck is called Inspiration. It’s a tech-filled version of a Freightliner rig and the worlds first licensed self-driving semi. 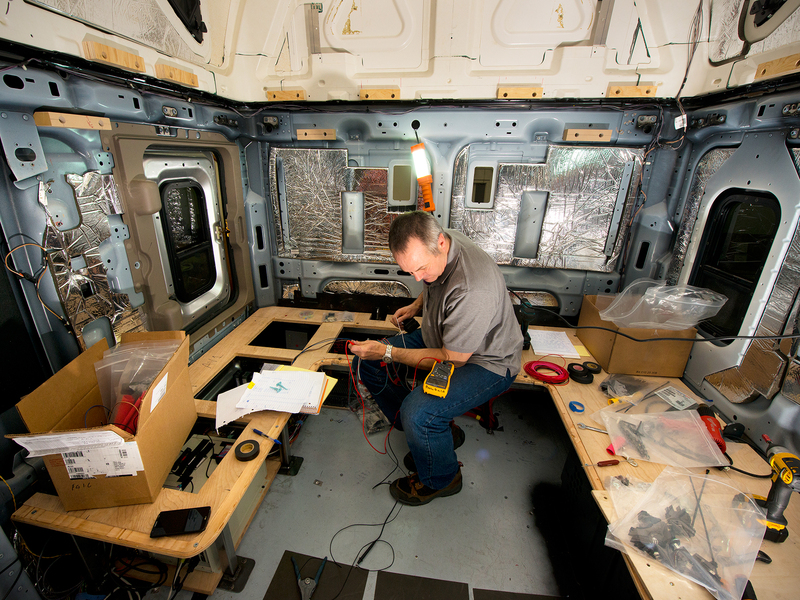 Urban is among dozens of engineers who spent six months frantically preparing the truck for its spectacular introduction in Nevada this week. What’s really surprising isn’t that his hands are off the wheel, but that they’re not wiping away tears of joy and waving wildly at passing cars. Daimler, which owns Freightliner and built this robo-rig, oscillates between boasting about the Inspiration (it rented Hoover Dam and threw down for a record-setting light show for the truck’s debut) and downplaying its significance. As amazing as this thing is—it’s a fully autonomous 18-wheeler that works—company execs say it won’t can’t change lanes on its own, it won’t be market-ready for a decade, and could never replace human drivers. Be that as it may, the Inspiration is a big step forward on the path toward the day when our vehicles drive themselves. The discussion of autonomous technology usually centers on cars, because that’s where many people will realize the benefits of improved safety, better fuel economy, and more free time. Most of the major automakers, plus tech giants like Google, are working on the hardware and software that will let regular drivers catch up on Facebook during their commute instead of holding onto the wheel and operating the pedals. Trucks aren’t flashy, but they’re critical to the economy. You don’t need an especially advanced autonomous system to make a dent in the crashes that killed nearly 4,000 people on US roads in 2012, about 90 percent of those were caused by driver error. Even a system that works only on the highway—where the technology’s already developed and where trucks spend the vast majority of their time—can be a huge help. The large freight carriers have already started the transition, equipping their fleets with active safety features like blind spot monitoring, adaptive cruise control, and lane departure warnings. The economic case for these technologies, the building blocks for autonomy, is clear. “Commercial vehicles are a safety issue,” says Xavier Mosquet, head of Boston Consulting Groups North America automotive division. “And therefore anything that can get commercial vehicles out of trouble has a lot of value.” And the carriers wants more of it. Daimler, which owns Mercedes-Benz, has been working on autonomous driving for two decades. Much of the technology in the Inspiration—the radars and cameras, the computing power and electrical architecture—has a long track record of commercial use in active safety features like lane departure warning and adaptive cruise control. Mercedes first equipped passenger cars with radars before Y2K and is now talking about a future in which driving is an option and front seats swivel to face the rear passengers. 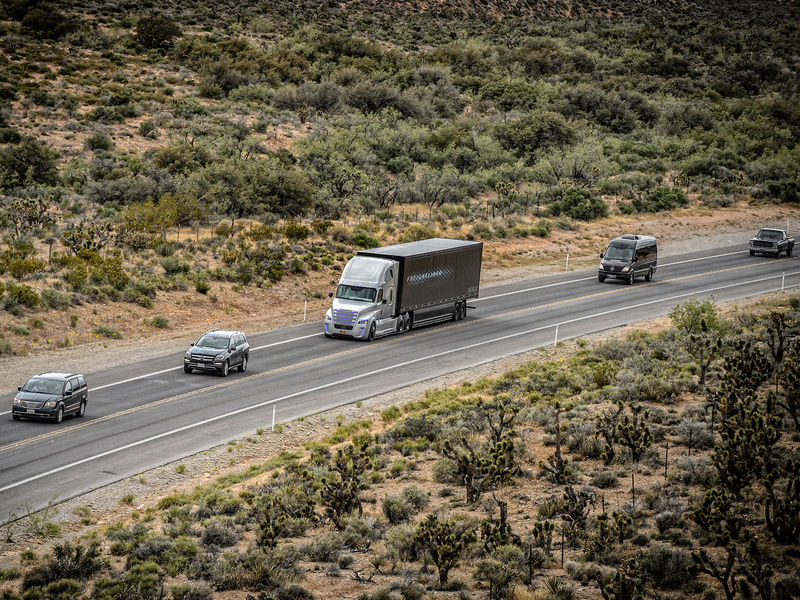 This year, Daimler started selling a “Detroit Assurance” package that outfits trucks with adaptive cruise control, blind spot monitoring, and lane departure warning. Work on the Inspiration, which upgrades that system by allowing the truck to steer and control its speed autonomously, started just six months ago. The team was mostly based at Daimler Trucks North America’s HQ in Portland, Oregon, with some extra hands in Germany. The Freightliner Inspiration is a limited take on autonomy. The system will kick in only once the truck’s on the highway and up to speed, and then it will maintain a safe distance from other vehicles and stay in its lane. It wont change lanes to pass slower vehicles on its own. If it truck encounters a situation it cant confidently handle, like heavy snow or faded lane lines, it will alert the human that its time for him to take over. The mechanical side of the project was relatively straightforward, largely because the company’s done so much of this work before. Trucks demand different actuators (the hardware that lets the computer physically tap into the steering, acceleration, and brakes), but it’s all “well understood,” says Dr. Wilfried Achenbach, senior VP of engineering and technology. Power, for example, is delivered by a pneumatic unit, so Daimler cooked up magnetically activated valves that block or supply air pressure as needed. The sensors used on passenger cars, however, were up to grade: Achenbach points out Mercedes sells cars for use on the Autobahn, where cars going 125 mph requirethe same kind of stopping distance as a tractor trailer. The electrical architecture underpinning the Inspiration is like a central hub with satellites, Achenbach says: The systems (speed control, lane keeping) work on their own, but there’s a central device that sees what each part is doing and makes high-level decisions (like when it’s time to tell the human driver to take control). That central system has been developed (Daimler’s keeping quiet on the details of how it works, exactly) but Daimler’s engineers have to lower its cost and shrink its size before it’s ready for market. It’s similar to what Audi calls the zFAS (for zentrale Fahrerassistenzsteuergert), a system that brings data from disparate systems into one place, like the human brain. Looking at the Inspiration, it’s hard to spot the things that make it different from every other truck hauling pallets. The radars in the front of the cab are hard to spot; the windshield-mounted camera doesn’t draw attention. A stereoscopic camera mounted in the upper part of the windshield reads lane lines. Short and long range radars, built into the grille just above the license plate, scan the road up to 800 feet ahead for obstacles. No sensors face backward, because theyre not needed. Theres no vehicle-to-vehicle communication and no LIDaR. The software algorithms are adjusted versions of the ones developed for use in Mercedes-Benzs autonomous passenger cars. The most obvious difference is the suite of blue LEDs the team installed around the vehicle, just like the ones in Mercedes’ futuristic F 015 self-driving concept car. They’re in the grille and the headlights, and in the screens for the cameras that could one day replace the side mirrors that create drag and aggravate every auto aerodynamicist on the planet. Inside, there are a few more subtle changes. The floor is wood. The back of the cab, usually used for sleeping, is all white and leather seating, specially outfitted to coddle attendees at the debut for test drives. The most significant visible alteration inside the Inspiration is the red button that reads “HWP,” lodged between the controls for the lights and the air conditioning. 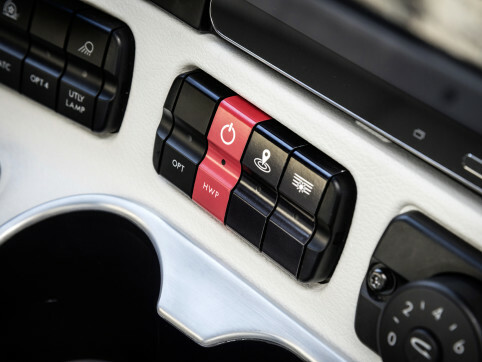 It’s the switch that enables Highway Pilot, Daimler’s name for the system that keeps the truck rolling at a steady speed, at a safe distance from other vehicles, and in its lane. 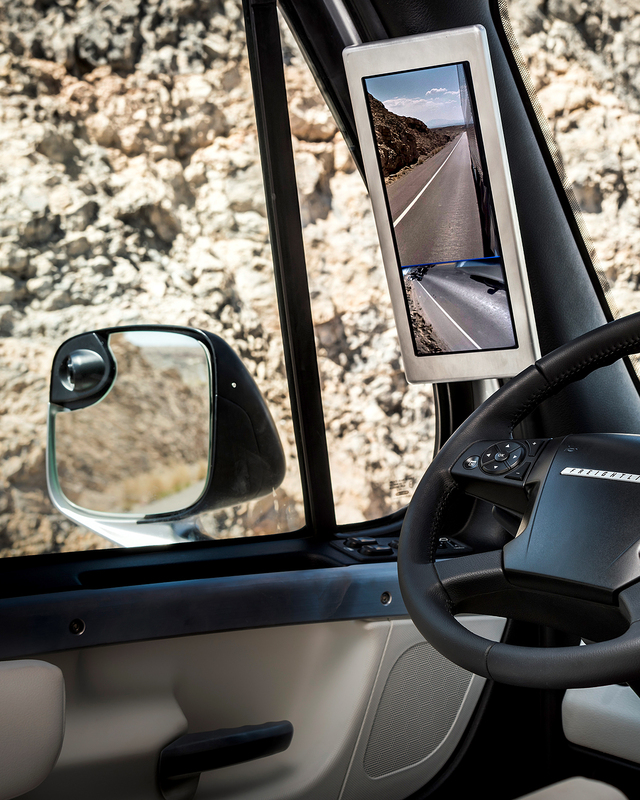 Going autonomous is a two-step process: Enable HWP, then once the truck is on the highway and cruising, turn on cruise control. From there, the truck’s in charge—until it hits rough weather, loses sight of a lane line, needs to pass another vehicle, or get off the highway. Those are the times when the human has to takeover, which means the system has to be made to make sure he knows to grab the wheel. For its A7 autonomous prototype, Audi based that process on focus group testing in Europe, China, and the US, creating a UI design that’s both simple and sleek. To earn the autonomous vehicle license plate from Nevada, Daimler needed to prove the system could safely cover 10,000 miles on its own. The team spun the odometer using two of the trucks, plus a testing mule (a non-fancy version with the same tech), on a test track in Germany and on quiet public roads in Nevada. Like with the UI, there’s a lot more testing to do before it’s ready to sell this system to the public. That means driving in extreme temperatures, slogging through rain and snow, for hundreds of thousands of miles, searching for and fixing any flaws they find. But even at this early stage, the system shows a lot of promise for transforming the trucking industry. Daimler can’t spend enough time saying it has no interest in getting rid of the driver (We dont want to get rid of drivers, says Sven Ennerst, head of Daimler Trucks development department). Its focus is on making driving easier, safer, and more efficient. It ran a small study (16 drivers on a test track) to see how this autonomous system affects drivers. EEG readings showed they were 25 percent less tired than they were when they had to steer themselves. That’s an advantage in and of itself, since drivers will be more aware when they do have to take the wheel. But it has serious potential: Right now, a truck driver can stay on the road for only 11 hours after 10 consecutive hours off duty. That’s a major pain given the major shortage of truck drivers in the US right now, which is only getting worse. In a recent survey by the American Transportation Research Institute, US carriers listed hours-of-service rules as their top concern. If Daimler can guarantee drivers are less tired when using its autonomous system, regulators might be willing to ease those rules. “Then we come very fast to a business case for our customers,” says Martin Daum, CEO of Daimler Trucks North America. The driver shortage is restricting demand for new trucks by 50,000 to 60,000 units, Daum says. That financial incentive is at the heart of this technology program: Teach the truck to drive itself, and Daimler doesn’t just have a superior product—it has a product that increases demand.